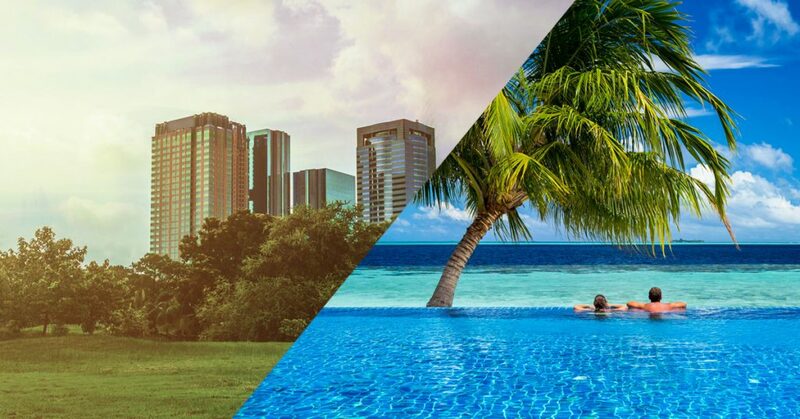 We hear the terms used interchangeably but do you know the main differences between a hotel and a resort? We are going to break it down for you today. Hotels: A hotel provides accommodations including a bedroom, bathroom, and basic amenities which sometimes include a swimming pool and gym. Hotels are more for people who are traveling for business and just need a place to stay while they are in town. Hotels can also be a temporary solution during the middle of a move or life changing event. Some hotels offer a continental breakfast option and others will have a small dining room or dining area. Hotel rooms are open to the interior of a larger building and normally has multiple stories. Resort: A resort is a complex that offers some sort of attraction such as a large beach, garden, park, swimming pool and multiple restaurants. Resorts can attract visitors from around the world. Conventions are usually held in resorts as they can usually accommodate larger groups of people and have multiple conference rooms and meeting locations. They also offer a variety of entertainment options. There’s really no need to leave a resort as most times they also include shops, food, and everything else you can need while traveling. Resorts attract more visitors that are vacationing, spending a holiday away and for relaxation. Whether your business is a hotel or a resort we have all the linens you need to run a successful operation. Sheets, towels, pillowcases, for the rooms, table linens and napkins for the dining area, and even kitchen towels we have everything required to keep things running smoothly. Our system makes the process fast and easy – and our exceptional customer service makes it a pleasure to work with our staff. Contact us for a free customized projection of service or call 772-336-0175.